This Owner has 2 Platinum Weeks to sell at this great price. 2 Bedroom, 2 Bath with Lockout Feature and Mountain View. Odd years usage, Platinum Season. Seller has two weeks available at this price! Amidst the 642-acre, gated Ko'Olina Resort with sparkling lagoons and a fresh ocean breeze in the air, lies Marriott’s Ko’Olina Beach Club in Oahu, Hawaii. Located on a child-friendly lagoon, right across from the Ko'Olina Golf Course, Marriott’s Ko’Olina Beach Club timeshare resales offer a level of service that you will only find from owning a Marriott timeshare resale. Timeshares for sale at Marriott’s Ko’Olina Beach Club are offered with multiple sizes and views. There are deluxe guest rooms, one, two, and three bedroom villas with one, two, and three baths. Choose from oceanfront, oceanview or garden/mountain views. All of the villas offer a full kitchen with cookware and tableware, televisions and DVD player, washer/dryer, and separate living and dining rooms. From your villa enjoy views of the ocean, mountain, and your own private lanai (“lanai is the Hawaiian word for “balcony”). The master suite has a king bed, an oversized tub, and a shower. The general room features include: air conditioning, an alarm clock, a crib, electrical adapters, individual climate control, iron and ironing board, down and feather pillows, a pull-out sofa bed, an in-room safe, and a washer and dryer. The bathroom amenities include a hair dryer and a separate tub and shower. For your convenience you’ll find some in-room business services including a dual-voltage electrical outlet, voicemail, and high-speed internet access. Each kitchen includes a microwave oven, pots, pans, serving dishes, a refrigerator, silverware, and a table and chairs. Each room has a cable/satellite TV. Marriott’s Ko'Olina Beach Club timeshare resales offer an outdoor children's pool, three swimming pools and seven hot tubs for soaking your muscles after a long day of nothing but relaxation. Don’t worry about packing extra towels in your luggage complimentary towels are provided at this resort. Guest services found at Marriott’s Ko’Olina Beach Club include a cash machine/ATM, concierge desk, foreign exchange, laundry on-site, newspaper delivered to your room, and safe deposit boxes. The business services offered include a copy service, fax service, notary public, overnight delivery and pickup, post and parcel, and a secretarial service. There is a beauty shop nearby and there is a newsstand and gift shop. If you want to keep up your exercise routine while on vacation, you’ll find an on-site fitness center complete with cardiovascular equipment and free weights. Get your exercise while enjoying your day out on a beautifully sculpted golf course. Visit the Ko'Olina Golf Course conveniently located just across from Marriott’s Ko’Olina Beach Club. If you’re the type who wants nothing but relaxation on your vacation then stop by the spa the Spa by the Sea at Ko'Olina. Indulge in one of many treatments offered to awaken the body and indulge the senses. If you’re an active vacationer, buying a timeshare resale at Ko’Olina Beach Club will not disappoint you. There is a biking trail, hiking, horseback riding, kayaking, mountain biking, sailing, a sauna, scuba diving, snorkeling, surfing, and tennis nearby. You may take your family to the Kamaaina Kids Club for a full or half day program and learn a variety of Hawaiian cultural activities. Take a short drive into Waikiki where you can visit famous beaches, shop, dine or visit the many bars and clubs. This is where you’ll find Oahu’s nightlife. Just a short distance from Waikiki and Honolulu you can hike the Diamond Head Crater and find panoramic views of Oahu. While in South Oahu, don’t miss out on the amazing snorkeling of the Haneuma Bay Nature Preserve. See fish of all colors and sizes come right up to you snorkel mask! For the long scenic driver you can take a road around the entire island taking in its incredible vistas. Stop and visit the Polynesian Cultural Center on the East side of the island. In North Shore stop for some of Oahu’s famous shoe string fries and shaved ice, just before hitting some of the world famous surf points and witnessing for yourself the enormous Hawaiian waves. A trip to Oahu would not be complete without a visit to Pearl Harbor. Tour surface ships, submarines, the USS Missouri Museum, and see the sunken USS Arizona while you pay your respects at the war memorial. With so much to see and do in and around your Marriott’s Ko’Olina Beach Club fractional ownership, you’re bound to work up an appetite! You have the choice to stay and eat at one of the on-site restaurants or to try somewhere nearby. Chuck's Steak House is on-site and is nice for a casual dining atmosphere. Kolohe's Beach Bar and Grill is also on-site. They serve sandwiches and have great views of the ocean, a full service bar, and casual open air dining. You may also try The Market Place, which is open for breakfast, lunch, and dinner. For a Mediterranean mix of fresh, local, and international flavors try Azul. Another option for enjoying some of the local cuisine is Naupaka Terrace. Naupaka is an all-day dining restaurant, with food selections that blend fresh, local cuisine, and a unique Hawaiian taste that will satisfy you for breakfast, lunch, and dinner. You may also want to try Roy's Hawaiian fusion with classic dishes like: blackened ahi, hibachi salmon, and Szechuan baby-back ribs. If you are in the mood for Japanese you may want to visit Ushio-Tei, which serves traditional Japanese dishes, sushi and sashimi. 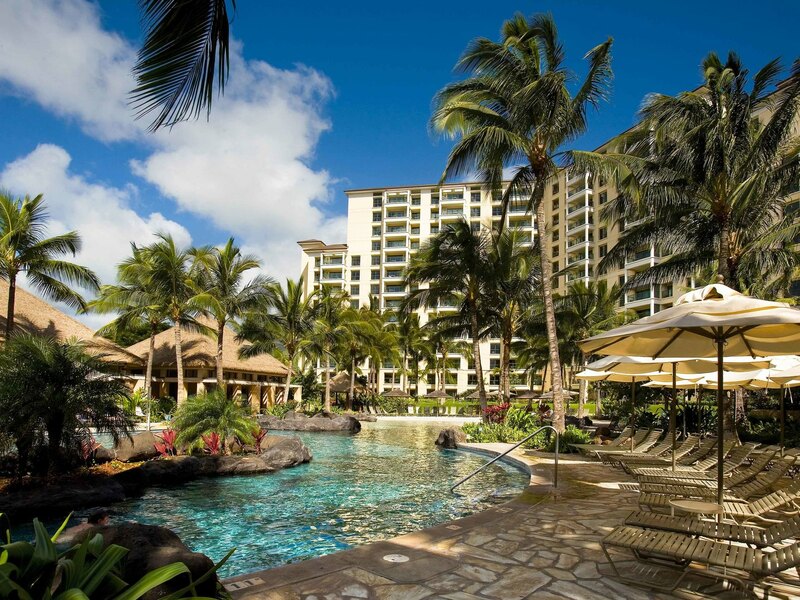 Whether you want to buy or sell a Marriott’s Ko’Olina Beach Club timeshare, Premier Timeshare Resale’s helpful, friendly timeshare resale agents will take you through the process with satisfaction and ease. Premier Timeshare Resale has many timeshare resale deals, even the pickiest of buyers will walk away happy. And for those looking to sell a Marriott timeshare, keep in mind there are no upfront fees.